The realization of a luxury lifestyle extends beyond simply owning luxury real estate, it encompasses a broad appreciation for the finer things in life with an value system that resonates beyond ordinary acumens. A yacht is more than a symbol of wealth; it is an investment of passion. As such, a yacht is the pinnacle expression of an exclusive luxury lifestyle. The spectacular M/Y SEA SIX 92′ 7″ (28.22m) Riva Duchessa 2010 yacht, currently for sale, presents a prime opportunity for a savvy buyer to add to their luxury portfolio, with a recent price reduction of $200,000. The Riva brand is famous worldwide for class and classic beauty, and yacht SEA SIX epitomizes these qualities. Launched in 2010, SEA SIX accommodates up to 8 guests in four beautiful cabins, including a master cabin with a full-beam bathroom with his and hers connected by an adjoining shower, as well as a queen-sized VIP and two twin cabins. Special features of this yacht include a beautifully bright salon and dining room and a tender garage, which can also serve as a small beach club with a lounge by the water’s edge. Also on deck you’ll find a large dining area on the aft, with walk-around teak decking leading to the bow seating and sunpad lounging area. 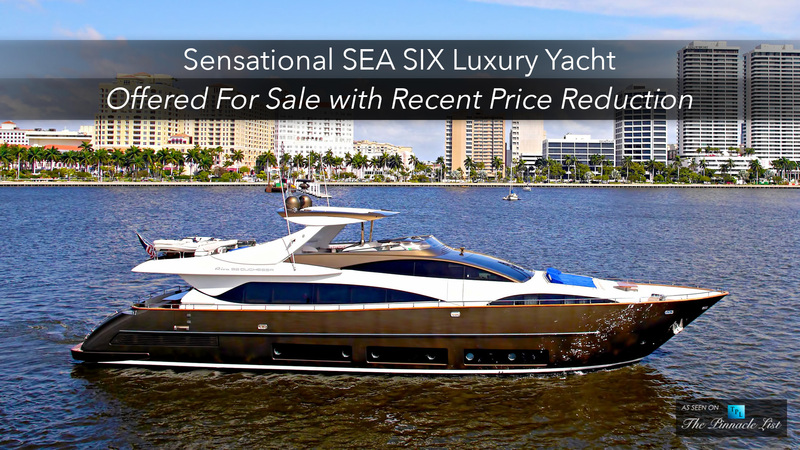 The SEA SIX yacht for sale has very low hours and represents an excellent buy at an asking price of $4,900,000 USD through Worth Avenue Yachts. She is currently located in Fort Lauderdale, Florida. Contact us today at The Pinnacle List via sales@thepinnaclelist.com or message us on Facebook for further details.